Polish-American scholar, author, and philanthropist; born in Piotrkow, Russian Poland, Feb. 23, 1823; died in Summit, N. J., May 10, 1888. He was the son of Phinehas Mendel Heilprin, and was brought up in an atmosphere of enlightened Orthodoxy which was not antagonistic to the acquisition of secular learning. His father was his only teacher, and his good memory, combined with a great capacity for work, helped him to lay the foundation of his encyclopedic knowledge. Heilprin married early, and in 1843 emigrated to Hungary. He established himself as bookseller in the town of Miskolcz. He thoroughly mastered the Hungarian language; and his articles and poems in the cause of liberty attracted attention during the stormy days of 1848 and 1849. He became acquainted with Kossuth and other leaders, and, when the short-lived independent government was established, became secretary of the literary bureau which was attached to the Ministry of the Interior, presided over by his friend Szemere. After the collapse of the Revolution he went to Cracow and remained for some time with his father's friend, Isaac Mieses, with whose nephew, the philosopher Fabius Mieses, he formed a friendship which lasted throughout his life. From Cracow Heilprin went to France, where he remained less than a year, and where he suffered from a malady of the eyes which for a long time incapacitated him for work. At the close of 1850 he returned to Hungary and settled as a teacher in Sátoralja-Ujhely. He then devoted his leisure to the study of the English language and English literature, and in 1856 went to England with the intention of settling there; but, following the advice of Kossuth, whom he met in that country, he proceeded to the United States. Heilprin settled in Philadelphia, where for two years he taught in the schools of the Hebrew Education Society. In the exciting times preceding the Civil war he "saw but one struggle here and in Hungary," his sympathies being actively enlisted in the anti-slavery cause. In 1858 he was introduced to Ripley and Dana, the editors of "Appleton's New American Cyclopædia," and they were so impressed with the extent and accuracy of his knowledge that he was forthwith engaged by them to read and verify the geographical, historical, and biographical articles which were to appear in that publication. He also contributed a mass of valuable articles to the "Cyclopædia," among them "Hebrews," "Hungary," and "Poland." In 1858 he took up his residence in Brooklyn, where he became intimate with several members of the Kossuth family. In 1863 he removed to Washington, where he remained for two years, again engaging in book-selling. He also founded there a periodical called "The Balance," which existed for a short time. In 1865 he returned to New York, and at once began to contribute book reviews and articles on European politics to the newly established "Nation," on which he remained a constant collaborator until his death. From 1871 to 1876 he was engaged as associate editor on the second edition of the "American Cyclopædia." When the persecution of the Jews in Russia in 1881 sent a flood of refugees to America, Heilprin threw himself heart and soul into the work of relief. He took an intense interest in the colonization plans of the earlier arrivals, and soon became absorbed in the work of the Emigrant Aid Society. His self-sacrificing activity, described by him in a letter to Fabius Mieses in 1887 as "a laborious striving which almost amounts to martyrdom," ended only with his life. 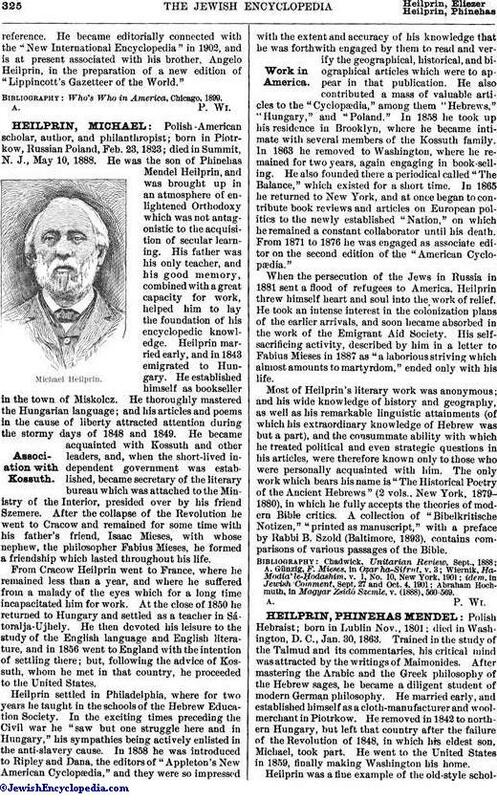 Most of Heilprin's literary work was anonymous; and his wide knowledge of history and geography, as well as his remarkable linguistic attainments (of which his extraordinary knowledge of Hebrew was but a part), and the consummate ability with which he treated political and even strategic questions in his articles, were therefore known only to those who were personally acquainted with him. The only work which bears his name is "The Historical Poetry of the Ancient Hebrews" (2 vols., New York, 1879-1880), in which he fully accepts the theories of modern Bible critics. A collection of "Bibelkritische Notizen," "printed as manuscript," with a preface by Rabbi B. Szold (Baltimore, 1893), contains comparisons of various passages of the Bible. Abraham Hochmuth, in Magyar Zsidó Szemle, v. (1888), 560-569.